The large two-storey living pavilion incorporates two living areas on two different levels. 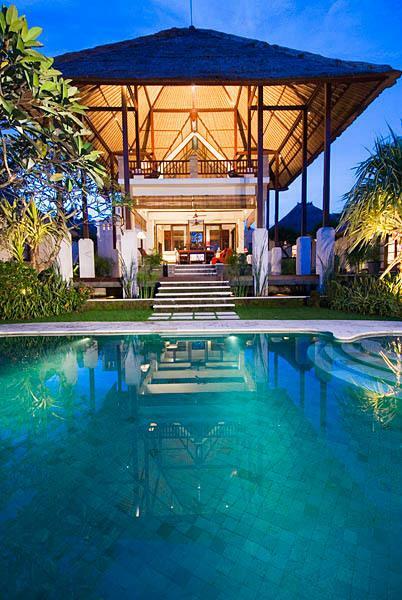 The downstairs open-sided living room is encompassed by fish ponds and a timber deck. 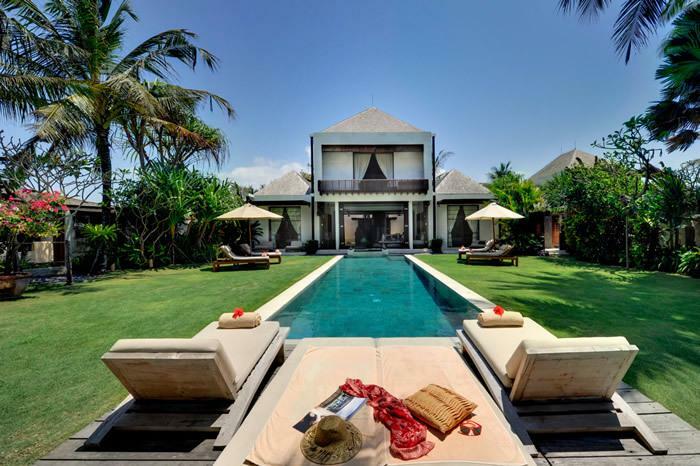 This breezy raised pavilion presides over the pool and garden and its marble floor is gracefully furnished with an Oriental rug, lazy chairs, sofa, standard lamp and a coffee table. A 42-inch, flat screen, multi-channel TV, DVD, CD player and radio stereo system is discretely housed within a wooden cabinet, and there is also a comprehensive collection of videos, books and games. The decor is enhanced by some colourful local artwork and artifacts; a ceiling fan helps to keep the area cool and blinds can be dropped for privacy. A guest washroom is located downstairs, just off the living room. 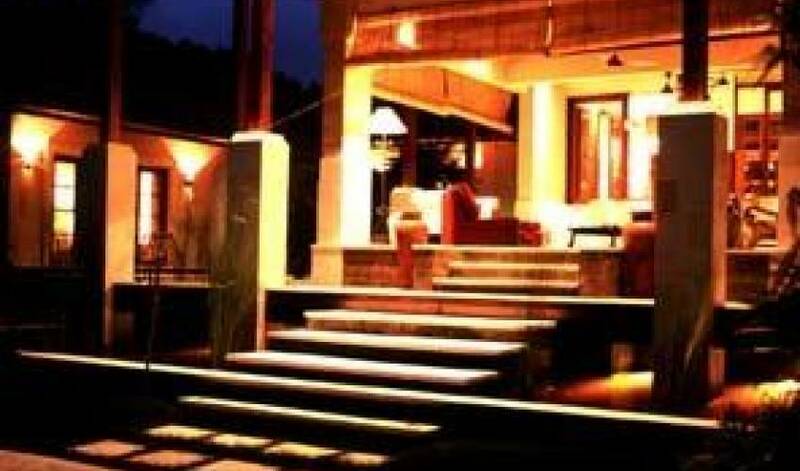 The upstairs lounge is accessed from the dining room, via a sliding door that leads onto a Palimanan stone staircase. 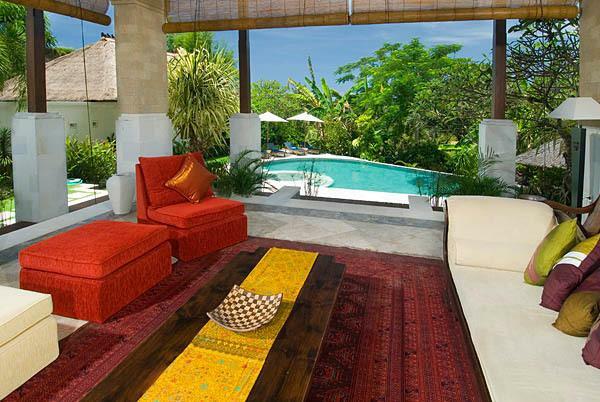 This peaceful lounge is another wonderful, breezy open-air space. 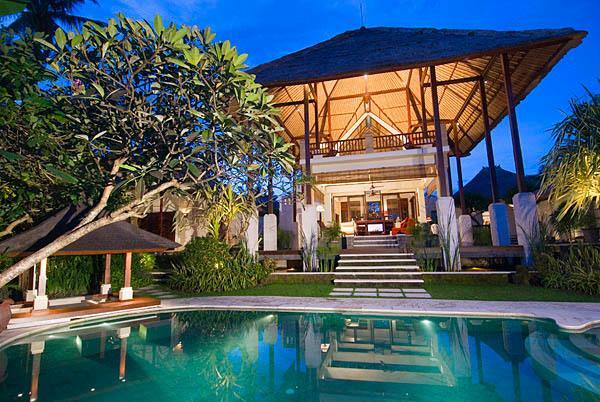 It features a teakwood floor under a soaring thatched roof, and is furnished with wide opium daybeds, a pair of leather Kartini chairs and an Oriental rug. Boasting a splendid view of the garden and the river valley extending to the ocean, this is a great area for chilling out and relaxing with a book. Every need is considered with the additional provision of a ceiling fan. An all-glass Cathedral window extends from the roof to the ground floor, and separates the upstairs lounge from the air-conditioned work room. This delightful study presents a teak desk with a computer and internet access for the use of the guests. An eye-catching painting adorns one wall, and a long Oriental rug rests on the warm timber floor, together with leather-upholstered Kartini chairs and a bookcase full of magazines. To one side of the work room is an open-air stone terrace surrounded by a balustrade. The air-conditioned dining room is linked to the downstairs Living Room by two sets of Palimanan stone steps. With a marble floor, and large glass sliding doors on three sides, the room has an open feeling; it is furnished with a dining table for eight, and fitted with a glass-fronted teak cabinet. The small but well-equipped air-conditioned kitchen is conveniently positioned next to the dining room. It features a marble service counter, marble work tops and teakwood wall cabinets. 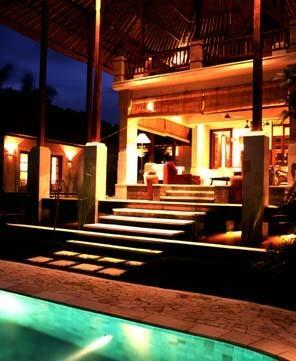 On the far side of the kitchen is an attractive water court, with large stepping stones across the fish pond. 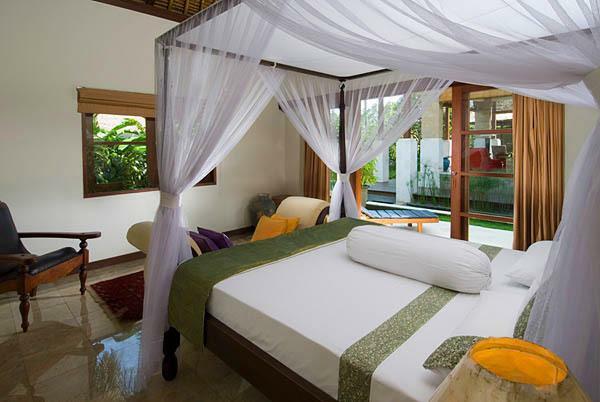 Bali Villa 392 is equipped with four self-contained bedroom suites, each located in private thatched pavilions and each one linked to its own indoor bathroom and private outdoor shower. 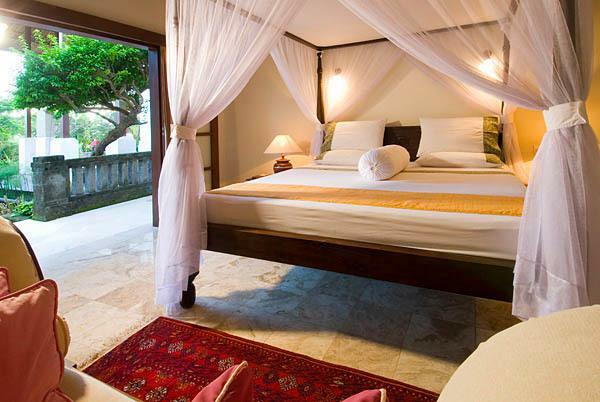 Two of the bedrooms boast private plunge pools, and two are supplied with music systems. 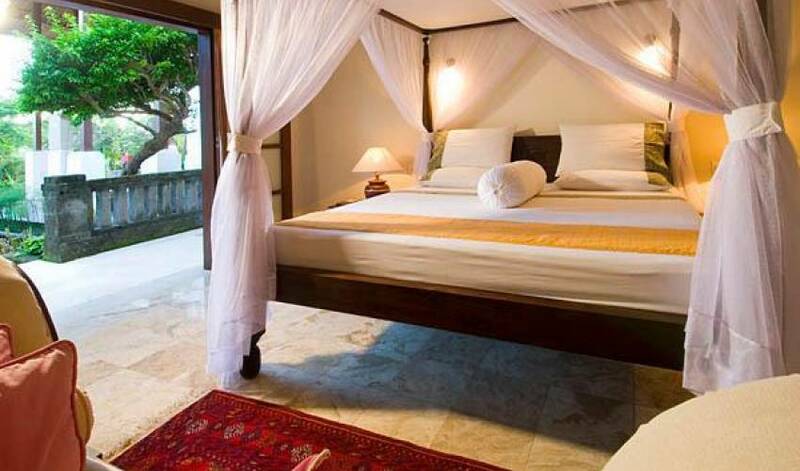 Each marble-floored, air-conditioned bedroom is furnished with a queen-size four poster canopied bed, a chair, bedside tables and lamps, while bold local artwork adorns the walls. Dressing areas, with fitted cupboards and walls mirrors, lead into marble bathrooms each complete with twin washbasins, a bathtub, an indoor shower and a toilet hidden behind a teak door. Each bathtub is positioned beside a picture window with doors opening into a small private walled garden. These doors can be opened to create an alfresco bathing experience, and there is also an open-air shower in each of the private gardens. A fifth bedroom (without en-suite bathroom), furnished with up to four extra single beds, is ideal for children. 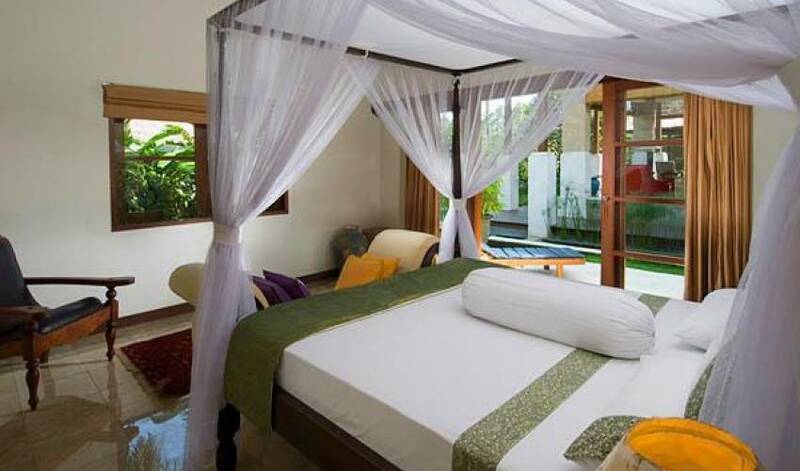 The beautiful landscaped gardens of Bali Villa 392 are planted with sweet scented flowering shrubs and tropical trees. The freeform, infinity-edge swimming pool overhangs the river valley and is flanked by a stone pool deck. At one end of the pool are some sunken stone bar stools flanking a pool bar with an attractive ironwood shingle roof. 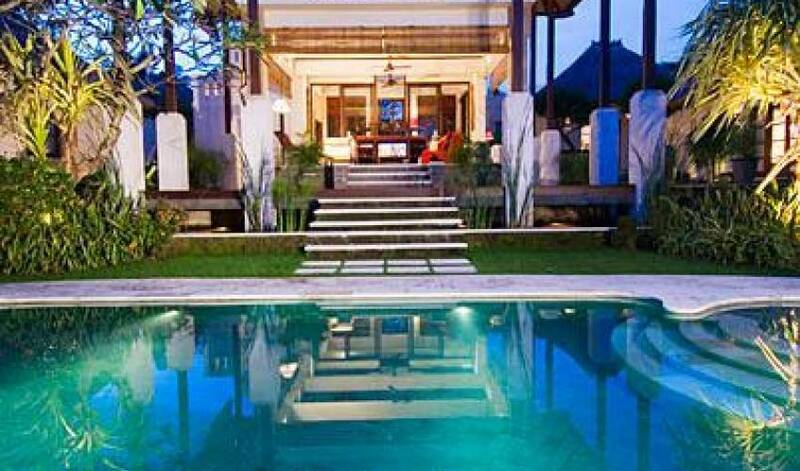 Quiet and safe, Villa 392 is ideally situated in a rural setting five minutes from Sindhu Beach and the historical village of Sanur. 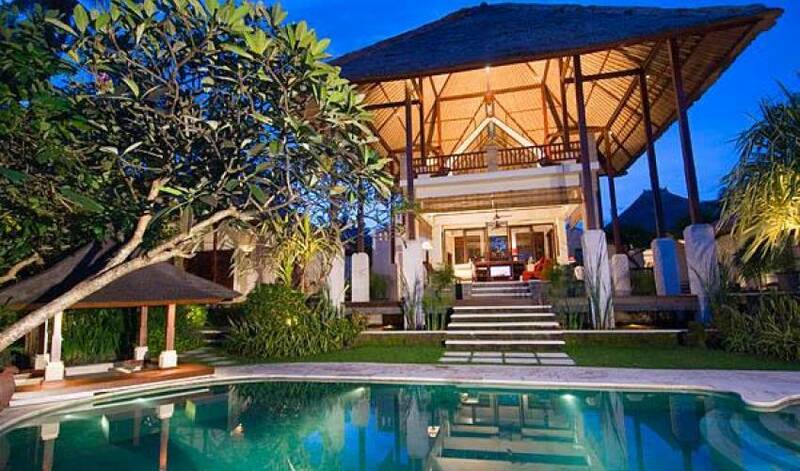 The nearby Sanur-Kusumba by-pass, which extends from Seminyak to East Bali, positions the villa within easy driving distance to most of Bali’s tourist attractions. 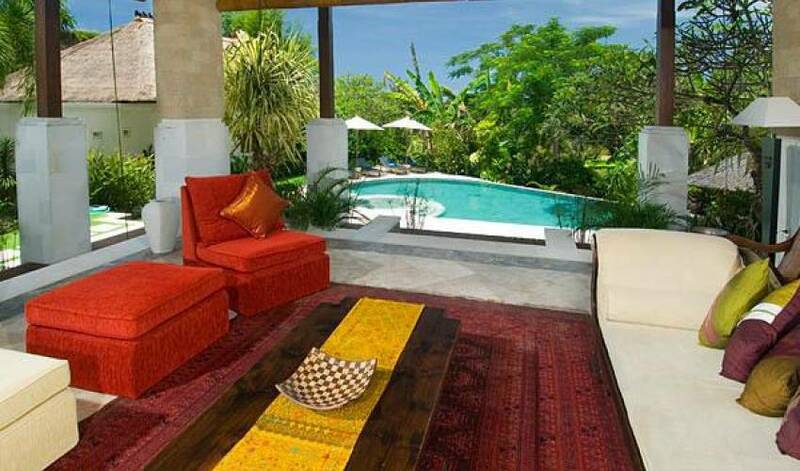 The diversity of Bali presents everything from diving, cruising and trekking, to adventure sports and theme parks. Horse riding takes place just a few kilometres away at Saba stables, and three of the best golf courses in the world are located within easy driving distance. 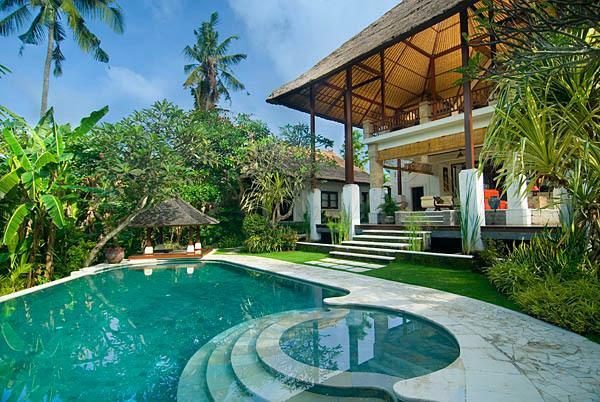 The villa is just twenty-five minutes’ drive from Bali’s international airport, forty minutes from the cultural town of Ubud, fifteen minutes from Sukawati art and handicraft market, and conveniently close to the Island’s numerous spas, shops, restaurants and vibrant nightspots.